Not sure where Sandman crawled out from but that is one of the more negative takes from a Vikings 'fan' I've read. I thought it was magnificent stadium. Also love the "SKOL" chant. Status: offline Fantastic that we judge fans in a Viking forum. Since we're doing it, who's the best? Anybody? Does PFF have a grade? Wait, many of you don't like PFF. Maybe Arif has a fan rating analytic that he could share? No, he doesn't post here any longer. So, who is the best? Worst? Casual? Fake? What makes anybody think they are in a position to judge this? If you feel that you are, go ahead and lay it on me. Rank 'em. Be sure to include yourself in that #1 spot. Is there criteria that needs to be met? If so, what is it? I'd love to hear it. I might find out I'm not an approved fan. Personally, I welcome more Viking fans to this forum. It's needed. Doesn't matter one bit to me if I agree or disagree with any opinion they share. I'm happy when they share. Fantastic that we judge fans in a Viking forum. The seats are awesome Lynn. Except for the raucous bunch of young guys behind us. Just kidding.....they were having a great time & I remember being young like them a long time ago & behaving in the same manner so it was all good. Hey, mess with the Skol Chant and that's what you get! Must have been referring to one of these. I know, personally if I was Todd I would of used two of those little do hickeys on each side of the word but hey, I don't want to get all judgmental about it. Status: offline Got an email from the Vikings today notifying me that the tailgate lot I buy a season pass to has been built on as well as one other. They gave me the address of another lot that allows tailgating but I can't buy a season pass or even a single pass in advance. It's first come-first serve and it's about three blocks further away and from google maps it appears to have about 25% of the spots that the old lot had. Oh what could have been out in Arden Hills... The planners for US Bank Stadium should be lined up and shot. Was that too harsh? Yeah maybe. They should be lined up and forcibly sodomized. Status: offline TSA would have a ton of volunteers for that particular task. Status: offline I'm selling my VIP parking passes for the home games. You're parking in the lot directly next to the stadium, which has a direct access skyway tunnel connected. PM me for more info. Status: offline Atlanta got their stadium right. We screwed ours up. Again. Atlanta got their stadium right. We screwed ours up. Again. You learned that from TV? Have you been to our stadium? Status: offline I haven't been inside Atlanta's stadium, but ours is incredible. It's not a competition - let's just be happy with the crazy good place we have. It's here. Above all else at least the damn team didn't move. This should count for 30 pros. The big doors are really neat especially when open. The score boards are fantastic. The clear half of the roof is neat. The plaza outside of the legacy gate (big doors) is well laid out and lots of fun. The park just to the west of the plaza is even nicer with green grass and tons of fun things to see or participate in. Good access with light rail. Tailgating is on the verge of extinction. This should count as 15 cons. It's nearly impossible to get in line for concessions, get them, and get back to your seat in under 30 minutes. 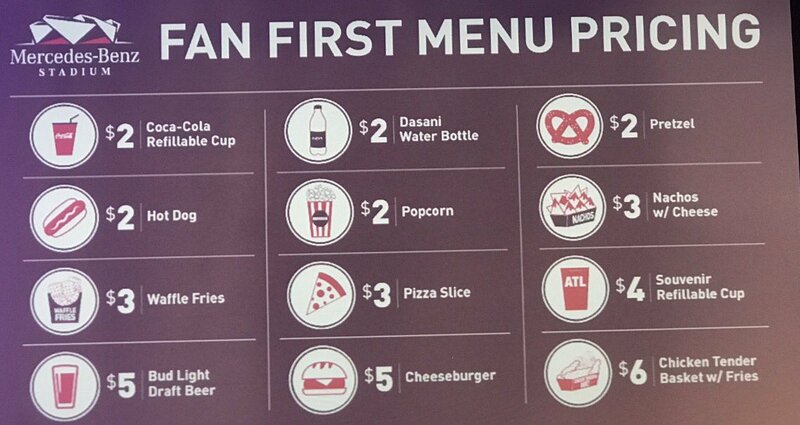 Concessions are overpriced even by stadium standards and quality doesn't match. Entry is a clusterf*%k. This is getting better but they need to make an effort to get people to use the gate that's printed on their ticket. If 66,000 people come to the game it feels as though 65,999 of them all enter the legacy gate. Very few of the features of the app actually work inside the stadium. We were promised replay, concessions ordering, concessions delivery, injury reports, and game breaks. As of today none of those features work. The thing that really gets me is that with the exception of the tailgating - all of the cons I listed are fixable. They don't seem to care enough to fix them though. I've filled out every STO survey sent to me and emailed every specific problem (including my online order during a preseason game which took my money but sent me to a concession stand that didn't exist). No response. Conversely, should I go three days past the due date of the tickets I get a personal call on my cell phone. Greedy bastards probably want everyone to go into the stadium early and drink high priced booze. That was the one thing that really stood out about Atlanta's stadium. That Arthur Blank mandated super cheap concessions whenever the stadium is used for anything. Total agreement. My wife and I actually rewound because we thought we misunderstood. Kudos to Blank. A Billionaire that continues to make billions and doesn't feel the need to squeak out a few extra hundred thousand on the backs of loyal fans. I'll make a bold prediction and predict that the Atlanta stadium revenues from concessions will be every bit as much as those that gouge. There's still profit in Atlanta's lower prices - the fans might just buy MORE of each thing. I'll be watching that with curiosity. I did too. I think they featured the $2 hot dogs and the $2 soda that you can refill for free from any soda machine around the stadium. I gained so much respect for Blank right there.